As one of the leading manufacturers of coating products in the world, we are setting an example for the entire industry. 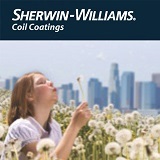 Sherwin-Williams Coil Coating is always working to incorporate the best practices and materials into our coatings. Sherwin-Williams is dedicated to driving the industry forward, through pioneering research and developing products for emerging needs that perform to the highest standards.